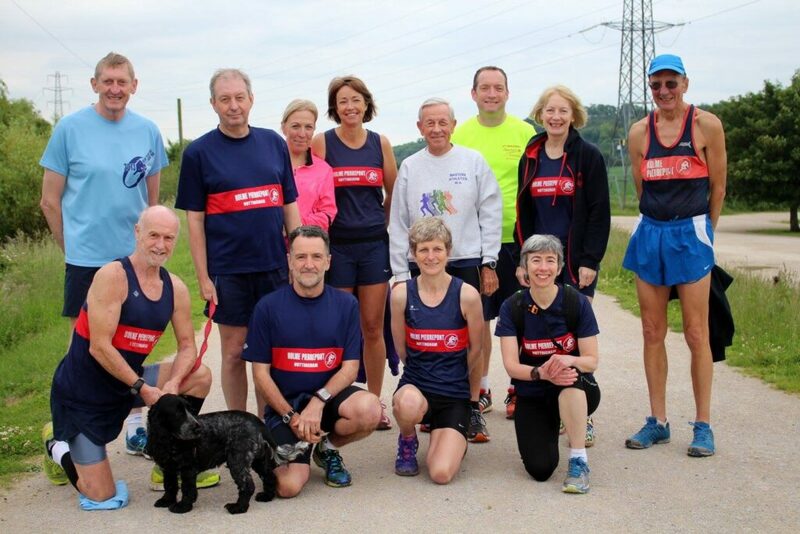 I met Christine Heaton when I joined Holme Pierrepont Running Club five years ago. I soon realised that Christine was a fast runner. And it seemed she was getting faster. 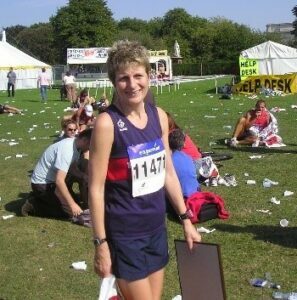 In 2015 at the age of 50 Christine ran a sub-20 minute parkrun (5 km), a time which placed her in the top 1% of parkrunners in the UK. 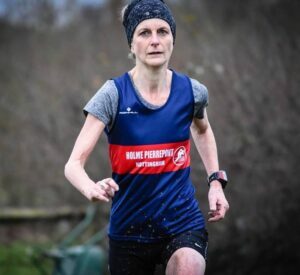 Later that year, aged 51, she ran a personal best time of under 1 hour 30 minutes in the Robin Hood Half Marathon, placing 27th in the UK in her age category for the half marathon distance that year. Christine and I are both in the V50 age category. I was very pleased that she agreed to be interviewed as I was intrigued to find out more about her running. What could I learn from her to improve my own performance? I was also aware that Christine had a chronic illness. It seemed surprising that someone with a chronic condition could be consistently in the top 50 in her age category in the UK. How was she able to combine managing her condition with performing so well in races? When I interviewed Christine at her home in Nottingham on 10th June 2016 she had recently returned from a week’s running holiday on the Isle of Wight with other club members. The trip included running a half marathon on the Sunday and then running for five consecutive days, covering 84 miles in total. I started running just before my 40th birthday [in 2004]. I was 40 in the August and I started about January. What was it got you started running? I’d never really done much exercise but I had in my mind that exercise was a good thing to do. I’d just left my job (primary school teaching). I’d started working for my husband and was home-based at the time. So all of a sudden I had a bit more time. When I was teaching, with a young family, I just found it really hard to fit any exercising in. Why did you choose running? I don’t think it was very conscious. It was the fact that it was easy, I could nip out whenever I wanted. I think also the fact that I was not very sporty. It’s something you know you can do. You could just slope off when it was getting a bit dark and no-one could see you. I never thought I would get into it in the way that I did. Was there any running background in your family when you were growing up? No. I was very unsporty at school. I was always the duffer that was picked last in all the teams. I’d say my parents, and my brother and sister were a bit sportier than me when we were growing up. My sister particularly was very good at sport at school. What running did you do as a beginner? So that was the start of it. Then my neighbour persuaded me that we could train over the summer and do the Robin Hood Half Marathon in September. I thought it was a massive thing, but I was quite taken with the idea. We didn’t really go back to running club, because she had small children. It was easier just to fit in training runs by organizing it between ourselves. I remember walking to the race with my family. We got over the suspension bridge and there was this smell of “Deep Heat”, and all these people with bin liners on, and I thought, “What am I doing? I don’t belong in this world. This is crazy.” It was the first race I’d ever done. We set off running. We chatted and ran about 9.30 pace. We got to 10 miles. My neighbour started to really struggle and we stopped. But we had this agreement that if either of us felt a bit bad the other one would carry on. So I carried on. I remember looking at my watch and I think it said about 1 hour 27 minutes. [That was] the first time I started thinking about times and I thought, “If I really bomb it I might be able to get under 2 hours.” So I tried to run as fast as I could. I got in and forgot to stop my watch for a few minutes and had no idea what time I’d done. My time was 2 hours 25 seconds. So I didn’t get under the 2 hours but it was a reasonable time for a first go. What did those last 3 miles feel like when you were on your own? I started to feel a bit like a proper runner, because we weren’t just chatting. I think I felt quite bad, you forget how bad you feel in races, but people were walking and I thought, “It is hard, I’m struggling but they look a lot worse.” That gives you a bit of confidence. Yes. I had thought I’d do the Robin Hood and then that might be it. It was just a bit of a one-off. I thought, “I’m actually quite into this.” So after a couple of weeks I started running again with my neighbour. Then she found out she was pregnant with twins. I sensed that I needed someone to run with so I [decided] to go back to the running club and really get stuck in. I ran the Turkey Trot (Half Marathon) that Christmas. I did that with my brother-in-law and we ran round talking. In those days it was all about covering 13 miles, but I did do 1 hour 50 or 1 hour 51. I knocked 10 minutes off, but put that down to the fact that the weather was colder than it had been for the Robin Hood Half Marathon. Christine with other club members – Pete Savage, standing left; Claire Hayes-Gill, next to Pete; Derek Poole, standing right. Did your motivation to carry on come partly from that experience of racing? Yes, a big part of it was the social camaraderie and the friendship. That was a big motivation. And finding out that I wasn’t that bad at it as well. My husband is a keen golfer and before I tried running I had a go at that. When I took up golf I just felt it was really hard for me and if something’s hard you don’t really want to carry on with it, do you? Running’s hard but in a different way. It is hard, but I think the thing about running is that wherever you start from everybody gets better, and quite quickly as well. You can go from not being able to run for more than a couple of minutes to being able to run a half marathon in a relatively short space of time. Whereas to get your handicap down in golf or to learn a skill takes a lot longer, especially the older you get. Is that sense of doing well at something really important to you? I wouldn’t have said that I was [competitive], but I think my experience of participating in running has made me realise that I am. I freely admit that I am quite competitive now. Has running allowed you to be competitive in a way? Yes. I think [my attitude to running] has changed. In the early days it was all about fitness, and it’s now become a sport. It isn’t really about being fit now. You just want to be fit enough so you can carry on doing running. Not that you’re running to keep yourself fit. In fact, we probably all do far too much running, and would be healthier, and better, if we did a little bit less. That’s what happens when it becomes a sport rather than you just doing it for fitness. Thinking back to that time when you started running, was there anything that was difficult or discouraged you? The main thing was that I had a health problem. I have ulcerative colitis and that was a big part of why I left teaching. I started with that two or three years before I started running, in my late thirties. I was teaching and I kept having to be signed off for lengthy periods of time because I was ill. It was just getting really difficult. I got the opportunity to work for my husband, and it made sense really. It was a hard decision but I thought I could always go back to teaching one day. And that was also a little bit why I started thinking about fitness because I thought it might help. I don’t know if it does or not. You’ve not really been able to tell? No. I’ve had ulcerative colitis for fourteen years. In that time, I’ve had some really bad flare-ups and I’ve had some periods when I’ve been really well. There’s not a clear correlation between running and flare-ups. At times that has been quite a challenge: managing the condition and the side-effects of the medication and running. It’s just part of my life. The past two years have been particularly challenging, although since Christmas I’ve gradually got better and I’ve been really well in the last couple of months. I’m on a new treatment. It’s quite a new drug and I think that it may be working. It’s an immune system suppressant drug that targets just your gut and is given intravenously at hospital every eight weeks. It’s not so systemic, but I am on a systemic immune suppressant as well which I take every day. So not too many side effects but at times running has been a bit of a challenge. It doesn’t seem to have affected my performance. It just affects my training. So have you had periods when you’ve not been able to run? Yes. Two years ago I actually had to go into hospital for intravenous steroids, and I didn’t run for about three months in the summer of 2014. Since then I’ve struggled a little bit to be consistent, so I just say, “I run when I can; and when I can’t, I can’t.” So I don’t really have a training programme. One of the things that shocked me particularly last summer was the times that I was running. Despite the fact that I hadn’t been very well and I felt as though I was hardly training, I looked back over the year and thought that actually I’d strung together quite a lot of training without realising it. So yes, training consistently is my main challenge. Do you do other things for fitness when you’re not running? No. I’m really bad at doing any kind of cross training exercise. I think it’s a time thing and also just lack of interest in other things. One of the things I have had on my radar for quite some time is that I ought to be doing some kind of strength and conditioning work. I’ve never really done anything like that but everything I read and everything I feel about my body [tells me] that’s what I need. I’ve recently had a session with Amy Whitehead. [Amy Whitehead is a Nottingham-based runner and coach who competed for England in the marathon at the Commonwealth Games in 2014.] She showed me some basic core and glute type exercises that I can do at home and I’m really determined to try and do those. I think running’s quite harsh exercise at times. Sometimes you maybe need something that counteracts that. Your time is quite precious to you. Do you want to keep your time for running? Yes, and I think that’s true of a lot of people. You struggle to find the time to actually go out to run. To a certain extent you build up your muscles by running. But as I’ve got a bit older I seem to have a lot more aches and pains, and injuries. I do realise that keeping my core strong can’t be a bad thing. You joined the club and you were starting to compete. How did things progress from there? It just evolved. I started doing some cross country. I bought my first pair of spikes. Probably entered a few more races because of the encouragement that you get from other people by going to the club, and finding out about things that you didn’t even know existed pre-running. The next significant thing was my first marathon. I can remember saying, “I’m never running a marathon, because if I ever lose my toenails, that’s it, I’m giving up running!” I’m not interested in that level of pain. Was that a big step? Yes, and I’d had this idea of a marathon floating around in my head. I didn’t want to say I was entering a marathon until I knew I could do it. So I just went out one day on my own to see how far I could run. I think it was seventeen or eighteen miles and I came back and thought, “Well if you can do seventeen or eighteen now you can probably do a marathon.” I entered the Robin Hood Marathon (2006), and that summer I probably trained pretty much properly. I got a training program off the internet and did some twenty milers, all that kind of thing. I think I was the only one of my group of friends at the time doing the marathon, but other people joined me for part of the long runs. I usually tried to meet up with people. I’m not very good at running on my own. I had three goals really: one was to just complete it without walking. One was to get a good for age qualifying time for London which would have meant running sub-3 hours 45 minutes. And one was to get under four hours which was a benchmark. The day dawned and it was the hottest day ever. It was twenty-six degrees. I really struggled. The first half was not too bad. I had various family and friends lined up to support me along the route. 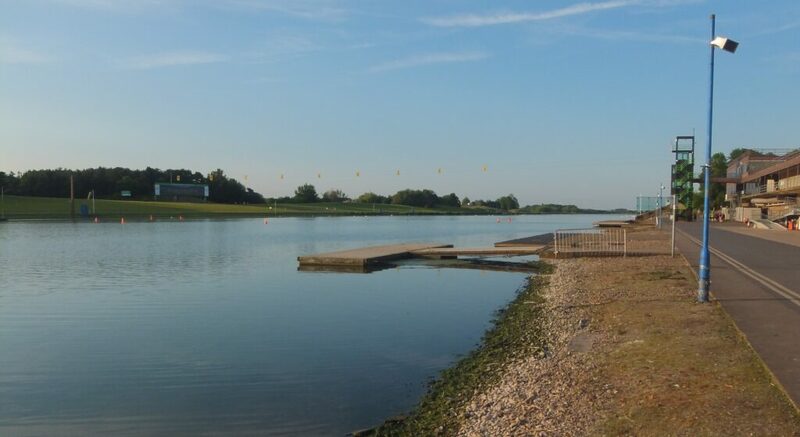 My husband said, “It’s really weird, everyone came along at about 18 miles [just before the lake at Holme Pierrepont], and they all looked kind of OK.” Then he cycled round to where we came off the lake, “Half an hour later coming off the lake everyone looked so done in, like you’d all been sprayed with some deadly poison”. At that point between 18 and 22 miles the wheels fell off, and they did for me. I managed not to walk but every bit of me wanted to walk. My brain was telling me to adopt a run/walk strategy, but I just kept running. I did 3 hours 56 minutes I think, so I got under four hours, but missed the London qualifying time. Why was is it so important to you not to walk? I think I would have felt that I hadn’t run a marathon. I don’t think I’ve ever walked in a marathon. I think to me at the time that was what it was all about. I very rarely walk in races but I’m not against it. Even when I’ve felt really bad, somewhere in my mind I know that if I do give in to it, that will be it. It will be really hard to get going again. Is it almost a fear that walking signals giving up? I’ve experienced a couple of really bad races where I probably should have pulled out and didn’t. At the Dublin Marathon (2013) I tore my calf muscle, and carried on and ran. I started to feel it at three miles. I stopped at 11 miles, thinking I might pull out there because it was really hurting. And then at 25 miles it completely blew up. I had no option but to stop, but I was so near the finish I just had to carry on and get over the finish line hobbling. I was really wrecked. I had a massive bruise all down my calf. It took a few months to recover. I think if I’d pulled out at 11 miles it probably would have just healed. Would you pull out if you found yourself in that situation again? You know what, when I look back now I think if I had pulled out I’d never have known whether it would have got worse, or whether I would have got round. I still did a reasonable time: 3 hours 32. It probably was right to carry on, because I don’t have that doubt in my mind. Do you think determination is a really important part of going the distance? Yes, I think it is. That’s partly borne out of experience as well, the more experienced you become the more you know what you can get away with. Finishing and being able to say you’ve done it, are important to you. I’ve just done the Isle of Wight [running holiday with other club members]. My whole mantra before I went was, “I don’t care about doing all of it. I want come back in one piece.” By about Wednesday the knee support and the Ibuprofen are coming out, because you really want to do it all. Apart from getting a cold, I felt that my body held up better than it has done on any of these other type of events. So I was really pleased about that because the last couple of years have been difficult. 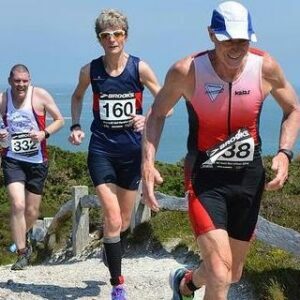 I was running along in the Isle of Wight thinking, “I feel quite strong. I feel I’ve got my stamina back.” I felt really pleased with how my body reacted. Quite early on you realised that you could run quite fast. Have you carried on improving? When you’re faced with a challenge you don’t want to give up, but on a day to day basis you’re quite good at listening to your body. I think a lot of people run when they shouldn’t. We’ve all done it. You learn after a while when you need to back off. Over the years I have become more confident that I can compete, or run a certain time. Last summer , I got PBs or close to PBs on most of my distances apart from the marathon. I felt that I got a little bit faster, but not a lot. I do feel I’m absolutely at my limit. I don’t think I could knock another 10 minutes off a half marathon for example. You just get to point where you know it will only be smaller improvements. It’s all about running the right course in the right conditions, feeling great on the day, you might knock a few seconds off. Then in cross country last season I got selected to run for the county for the first time ever. I’m probably going to start slowing down. How will I motivate myself when my motivation has been about PBs, times and winning? How [will I] cope with that? I look at people like Sandy and Derek, and other older people in the club, who’ve gone through it and I suppose all you can do is reset a little bit, and compete with your age group. We’re talking about times but there’s also the competitive side of racing. Is that something you enjoy? Not really. I find it excruciatingly embarrassing and uncomfortable. I do like beating people and over the years I have got to know ladies from other clubs. Most of them are lovely and we have nice chats afterwards. I find racing against people from the club really difficult. It’s horrible when you have to go past them, or they go past you. I don’t know why, is it a female thing? What do you hope for looking forwards? I don’t think about it too much because I like things to evolve rather than having real big targets. A general target is that I’d just like to be fit and well and healthy for as long as possible so that I can keep running. The kind of running I do will be dependent on how fit and well and healthy I am. If I’m going to keep running I’ve got to be really careful not to overdo it – practise what I preach. But at the same time you’d never go for a run if you thought “I can’t” for every little ache and pain. Do you think that having a chronic condition means that you’re better prepared for setting yourself different targets in future? You’ve got that experience of not always being able to do something, and because of that you really value what you can do. Definitely, and also I’m very wary of planning things in advance, because there’s a good chance I might not be able to do it if I’m struggling health-wise. For example, I’d never commit to something that was really expensive like going to run the New York Marathon. Maybe the longer that I stay well the more confident I’ll get about committing to things in advance. One little thing that I have on the horizon which is a bit of a pipe dream, is to run the London Marathon next year. The marathon’s the one where I haven’t actually got a PB, or done a good one, in recent years. You can get a Championship entry based on half marathon times. I ran 1 hour 29 minutes at the Robin Hood Half Marathon. Unless they change it I should be able to enter London in January to run off the Championship start with that qualifying time. Then it’s just whether I’m well enough. I’m definitely going to enter because if I enter and I can’t do it I can defer to the following year. I’d like to think that I could maybe train for it, set my stall out and really have a good run. Is there anybody who’s particularly inspired you? There are so many people at the club [who’ve inspired me]. The people who are inspiring me at the moment are people like Alex Loach, Mike Wells and their friends. [Mike and Alex are members of the running club who run every day with friends, and run ultras and many other races]. What I really admire about them is that they seem to absolutely love it and they never say, “Oh my god I’m dreading this race.” or “I’m so worried about this injury.” Their attitude is 100% positive. They really seem to appreciate what running has given them, whereas people who’ve come from a sportier background may take this for granted. It is easy to get quite down about running. It can become a stress. You’re always worrying about the next race and your injuries and I don’t want to be like that. I love the way that they’ll jog round at parkrun and help people. That’s the route that I’m a bit drawn to, [I’d like to] take something of their attitude and try to do that in my running. What would you like to ask women runners over 50? I’d love to meet a runner over 50 who is much better at running than me. [For example] the women in the top 5 of the Runbritain rankings. I’d like to know their background and about the sorts of things you’ve asked me. What kind of training they do? Do they do other things? What do they eat? What’s different about them? You always want to try and learn and improve if you can. 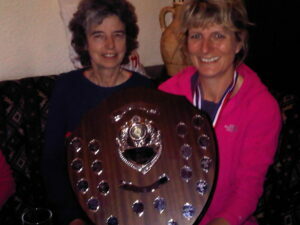 Christine with Jean Inglis, Ladies’ Captain at Holme Pierrepont Running Club. 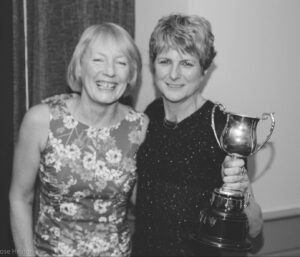 Christine was awarded the Ladies’ Captain trophy in 2015 for the third time. There has been an amazing progression in your running from when you first stepped out of your front door to where you are today. I could never ever have dreamed about it at the time. I’d have scared myself witless if I’d have realised that it would be such a big part of my life. If I’d been really bad at it I don’t think I’d still be doing it, and I don’t think I’d still be doing it if I hadn’t joined the club for the social side and people to run with. Thank you Christine for sharing your story with me. What an amazingly inspirational story. Thanks so much for sharing.it has given me so much to think about and work on. Hi, I enjoy reading the accounts of older women and their running experiences as I too am an older runner who loves to talk running and share her experiences with others! I too was a late starter, I began my running journey at around 49/50 with my daughter. We just ran up the road and back first but then we decided to go a little further and entered the 10k Race for Life and completed it with ease. I ran my one and only half marathon Robin Hood) in 2015 which was one of the best things I’ve ever done and enjoyed. I’m out in Portugal now, aged 55 and still running around 5k 4/5 times a week.